Turner Swim’s Canary Wharf 1 mile open water swim event takes place on Friday 19 July 2019. Heats at 06:30am and 07:30am with a maximum of 40 swimmers per heat. A fantastic event for both those looking to train towards a goal as well as for experienced triathletes too. The event is just over a week before the AJ Bell London Triathlon, so why sign up, swim hard and feel great heading off to work after! Our swim starts and finishes at the Docklands Sailing and Watersports Centre, with one lap around the perimeter of Millwall Outer Dock. Entry is just £20.00 including access to the Watersports changing rooms and warm showers too. The open water swim is a wetsuit only event and Turner Swim have a number of wetsuits that can be borrowed for the event. Will you win the first prize of £100.00? Or last prize, and win a one hour swim coaching session with Turner Swim? 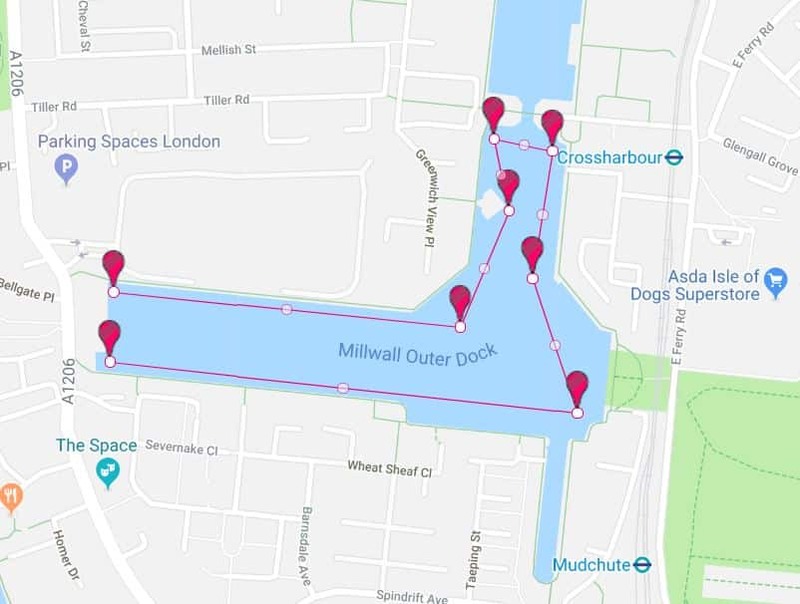 As per our 2018 format, the one mile swim course is 1 lap around 6 buoys to maximise the water space available in Millwall Outer Dock. This is the same open water swimming course that the Great London Swim used in 2013. Times are recorded by our team (no timing chip needed) and full safety is provided by our qualified coaches and Watersports Centre staff. Route map for our 1 mile open water swim event, Canary Wharf. The one mile timed swim event is a celebration of Turner Swim’s second season operating open water swimming coaching in Millwall Dock. We have been running one-to-one adult swimming lessons since April 2013 and in May 2018 expanded into open water swimming coaching. We are delighted to be providing both one-to-one and group coaching sessions at the Docklands Sailing and Watersports Centre between May and August each year. Our sessions cater for adults of varying open water experience. Our Pool-to-Dock course is for those new to open water swimming. We also run weekly training sessions for experienced open water swimmers and triathletes. All participants must be able to complete the canary wharf mile swim course in less than 50 minutes. We reserve the right after 50 minutes for any remaining swimmers will be collected by one of the Docklands Sailing and Watersports Centre’s speedboats. 50 minutes is quite a long time, so hopefully this doesn’t put you off but just reinforces how important your safety is to us! The event is priced at just £20.00. Book early and secure your place in the wave of your choice, at 06:30am or 07:30am. We look forward to seeing your swimming efforts!